I write to you as a concerned resident of Eltham who was distressed to see your attitude to road cyclists as reported by the Herald Sun website on 21 October.1 These comments were irresponsible and risk inflaming tensions on Nillumbik roads, creating a dangerous environment for cyclists. These comments also overlook the great contribution road cycling makes to our area – a contribution which aligns with values of concern for the conservation of the area’s character which you yourself have professed. I am addressing your supporting comments here, and not the leading remarks of Diamond Creek police Sergeant Lindsay Dixon who called for banning cyclists on Heidelberg-Kinglake Rd. I do so because your remarks are inconsistent with your reputation and I do not believe you considered how the expression of such an attitude by the local mayor feeds a dangerous anti-cycling mentality with the potential to harm your road cycling constituents. In some respects the best way to deal with a story like this is to ignore it. As the Vic Roads acting regional director Nick Fisher states, a ban is not something they support and that is really the end of the story. Online news outlets turn these stories out routinely, simply to generate page hits. This attention is guaranteed by the animosity which has emerged from a minority of disgruntled motorists in the face of road cycling’s growth, and the sensitivity with which cyclists, as vulnerable road users, understandably respond. But the fact that such tension exists means we have an actual problem on our roads and considered responses are useful, even if the story in question is little more than click-bait. In this particular instance the three-term mayor of a progressive council with a reputation for conservation has, whether by design or not, thrown his lot in with the anti-cycling brigade. This, I think, is worth responding to, from my position as one of your road cycling constituents, and one for whom regular use of the Heidelberg-Kinglake Rd is important. Firstly, there is some lack of clarity in the discussion of this issue as to whether the section of Heidelberg-Kinglake Rd in question is that between St Andrews and Kinglake, as most cyclists have assumed, or from Hurstbridge to St Andrews as some commenters on the online article assumed. I will primarily address the section of road that ascends to Kinglake, and which holds a special place, not just for local cyclists now, but for Australian cyclists historically. 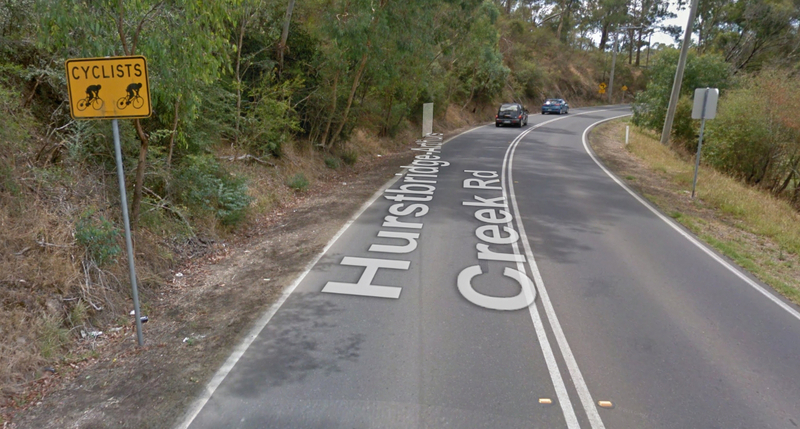 Much of what I write here is applicable, however, to any suggestion of a ban on cyclists between Hurstbridge and St Andrews. 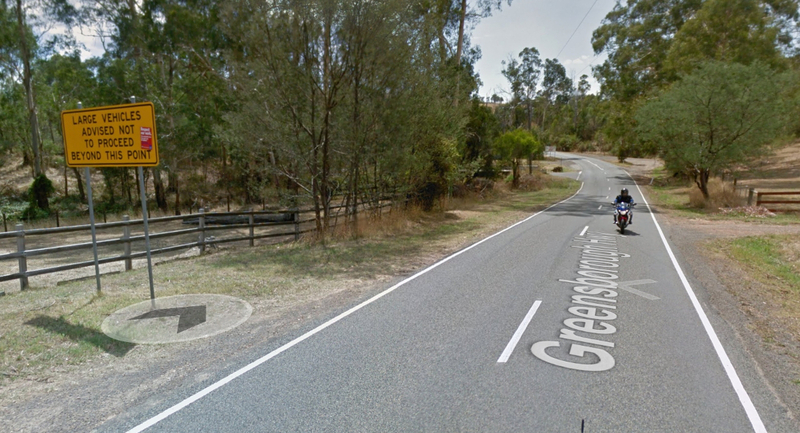 I first rode a bicycle along Heidelberg-Kinglake Rd, from St Andrews to Kinglake in January 2013. I was new to road cycling and I found the journey exhilarating. It provided a direct and personal experience of the environment which defines the shire of Nillumbik as an interface between the urban and rural landscape on Melbourne’s northern fringe. Since then I’ve done the same ride almost 100 times so I have a good stock of recent experience to draw upon in discussing the interaction of motorists and cyclists on the climb. My typical experience with motorists on this road is a model of cooperation I only wish was replicated more widely. The road is narrow and winding, but a cyclist leading a car is well positioned to see ahead and aid the driver’s overtaking. When I can, I do this with a beckoning gesture, and the great majority of passing drivers respond in kind with a gesture of thanks. You said, ‘“I cannot believe it; I drive up there regularly and you come across riders two abreast on this very narrow road and at 2km/h,” But the idea of drivers fuming with exasperation at being held-up just doesn’t square with my experience. Perhaps more drivers are seething with frustration behind me than I realise. I would hate to think this is the case, and prefer to think responses such as your own admitted impatience are the exception. Sometimes I come across groups of slower riders on the climb, sometimes they even exercise their legal right to ride two-abreast. Motorists encountering these cyclists simply need to drive cooperatively and wait for a safe passing opportunity, that’s just the reality of driving – you don’t always get to go as fast as you want to. I have never seen a group of cyclists wilfully obstruct a car on the climb, and riders will move quickly to single file to help a driver, or a faster cyclist for that matter, pass. A driver’s licence is a social contract and an understanding that the road must be shared cooperatively by all legal road vehicles is implicit in its being granted to you. As an elected representative you have a special responsibility to ensure your public statements on road matters are consistent with this principle. Sadly, however, in this instance your statements have not only contradicted this principle but potentially exacerbated tensions which create a dangerous threat to cyclists. In all my ascents to Kinglake I have encountered open hostility only twice. Once was on one of my first ascents where I brought along a friend – a following driver didn’t like us and laid on his horn with unnecessary aggression. It then took almost two years to be harassed as directly again, and this was the day after your comments were published. As I made my way up the hill, four police motorcycles descended in the oncoming lane followed closely by a ute-driving tradesman who shouted abuse at me. Obviously my ascent offered no impediment to his descent, he simply hated the sight of me cycling and his position directly behind the group of police motorcyclists did not discourage his aggression in the least. I won’t assume he was emboldened by media discussion of a cyclist ‘ban’ the previous day – by your comments and those of a Diamond Creek police officer – but the coincidence is disturbing. This psychological bias is fed by an often hostile news-media, and by comments such as yours, and the result can be a more threatening experience for those of us riding on the road. Until now I felt like I’d managed to avoid this sort of thing in Nillumbik. Abuse of cyclists is encountered here too, all too often, but the correlation between media sensationalism and fear for my personal safety is something which is new for me on my local roads. I have long thought that the area could do with a few more of these signs and Heidelberg-Kinglake Rd would be an ideal place to start. 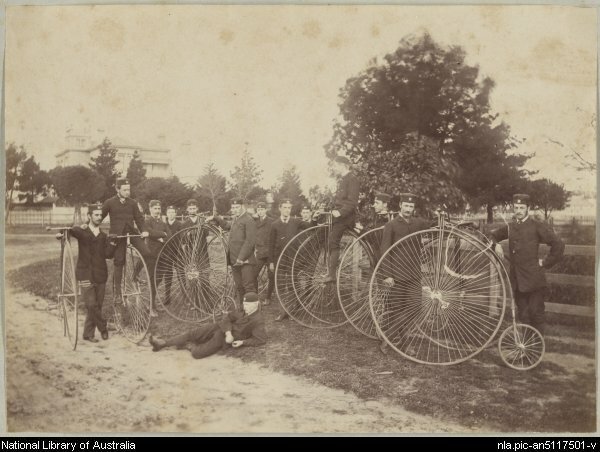 The Melbourne Bicycle Club circa 1878. Their ride was reported in the Evelyn Observer and South and East Bourke Record, on Friday 5 October 1883, with the paper declaring, ‘This, we believe, is the pioneer bicycle trip to the Mount.‘7 Their leg between St Andrews (then Queenstown) and Kinglake that day was just shy of two hours duration, and I must point out that even this equates to a speed faster than 2kp/h! After achieving his Tour win, the town of Kinglake acknowledged this connection with a large banner congratulating him (admittedly Kinglake is in the Shire of Murrindindi, but it’s the road to the top that got Cadel there). There are young up-and-coming professional cyclists who now make regular use of the Heidelberg-Kinglake Rd, following in Cadel’s footsteps. I think this is something council should be aware of, and take some pride in. After the devastating Black Saturday bushfires, cyclists of all sorts moved swiftly to offer support for the area to which they felt so strongly connected: MTB Victoria, CycleSport Victoria, the Degani-Kinglake sportive and the Cycling Tips website, amongst others, raised funds for locals and for the CFA. There is no sense in your remarks that you are cognisant of the road’s rich cycling history and its place in our cycling future. It also seems you fail to consider that the cyclists, who frustrate your driving, are quite possibly your own constituents. Cycling is one of the defining activities of our area, not merely on the great network of off-road trails and shared paths, but on our roads too. The strong community of Nillumbik road cyclists does much to promote the area and its conservation. Your online council profile says you are committed to, ‘preserving the character and environmental values of the Green Wedge.’9 You might not have considered this, but you’d be hard pressed to find a group of locals more supportive of the same view than the road cyclists of Nillumbik. Local cycling groups, like the GreenWEDGE riders, have been established, precisely to emphasise the beauty of the area as it is, and the importance of ensuring it is protected. Bicycle sales have outstripped car sales every year for the last decade, and more than four million Australians cycle regularly.10 It is somewhat baffling that you appear not to have recognised this boom has found positive expression on our local roads in recent years and that it is a phenomenon that aligns neatly with progressive goals for council. It is something to be encouraged, not depreciated in favour of outdated approaches to traffic management. The National Cycling Strategy 2011-2016, signed by all Australian transport ministers in 2011, called for a doubling of the number of Australians cycling by 2016, and for action plans, or policy statements at the least, from local councils on the issue.11 It would be great to see Nillumbik moving with this momentum, not against it. The strength of road cycling in Nillumbik is now earning international recognition for the area. The San Francisco based website Strava, which is the world’s most popular activity logging website for cyclists, has recently promoted Melbourne as a cycling destination.12 The website presented a selection of recommended rides, compiled with the aid of Melbourne cyclists, and some of Nillumbik’s roads came in for special mention, including the Kinglake climb. The natural beauty of our surrounds and the tranquillity afforded cyclists in a low-traffic environment are leading cyclists around the world to realise what those in Melbourne already know – Nillumbik is a special place for road cycling. This is great news for the area and portends an economic windfall for the local economy from a clean, environmentally friendly and healthy pursuit which draws the best of the area into focus. Some of the commenters on the Herald Sun article evidently saw the section of road under discussion as that between Hurstbridge and St Andrews. If this is the case, the same points of discussion raised here apply – the road exists to be shared, driver cooperation must be emphasised with public representatives playing an important role in this regard, and road cycling offers much for the local area and should be protected and promoted by council. I do have a personal anecdote to share regarding this stretch of road too. I was once nearly run off the road by some young men in a large car who shouted abuse at me as they forced me towards the edge of an embankment. I called emergency and was attended by Diamond Creek police who took the situation seriously. I later submitted a written statement on the incident but I was never informed of the outcome. I’d hate to think it ended up stalled on the desk of a sergeant with frustrated feelings towards cyclists. Finally, I note that your council profile states that you have a special love for driving between Kangaroo Ground and St Andrews. You say, ‘It always gives me a buzz because of its beautiful landscape and views.’13 It is indeed a beautiful route, and if it means something to you by car you are in for a very special experience if you take the same journey on a bicycle; you will find your connection to the natural environment is deepened, you will not have polluted it with vehicle emissions and you’ll be healthier for the effort. I would urge you to give it a go – if you really love our area, you might find it is a transformational experience. 1Megan Bailey, ‘Police call for ban on cyclists on treacherous stretch of Heidelberg-Kinglake Rd’ http://www.heraldsun.com.au/leader/north/police-call-for-ban-on-cyclists-on-treacherous-stretch-of-heidelbergkinglake-rd/story-fnglenug-1227096395093 [accessed 24 October 2014]. 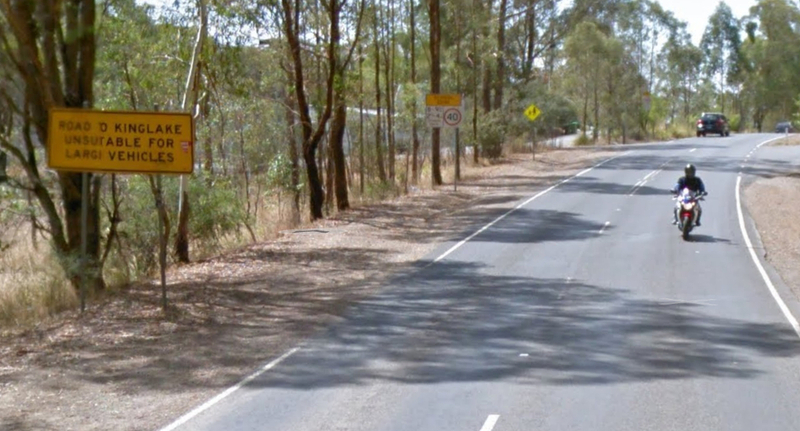 2The advisory speed limit for the descent from Kinglake to St Andrews is, as you would know, 35 km/h. Experienced road cyclists can safely negotiate the descent at over 50kp/h and descending motor vehicles often block the way for cyclists. 11Australian Bicycle Council, The Australian National Cycling Strategy 2011-2016, Austroads LTD, Sydney, 2010, p.23, digital version at https://www.onlinepublications.austroads.com.au/items/AP-C85-10 [accessed 24 October 2014]; ‘Feds try again on national bike strategy’, https://www.bicyclenetwork.com.au/general/better-conditions/552/ [accessed 24 October 2014]. 12Nicole Justice, ‘Seven Sweet Cycling Routes in Melbourne’, 20 October 2014, http://blog.strava.com/seven-sweet-cycling-routes-in-melbourne-8710/ [accessed 24 October 2014]. Cr Young is a three-term councilor, who has served as Nillumbik Mayor twice; in 2011-2012 and from October 2013 to 27 October 2014. Cadel’s tweet is from and unrelated exchange in 2009. I thought this was obvious from the timestamp on the screen capture and from the reference provided. At least one reader thought I had received the reply myself which I did not, and did not mean to imply. Well said Alain. I hope you receive a positive response. All the best for your cycling advocacy. Wow what a great response. As a cyclist I have had similar thoughts and views for some time, but I doubt that I could have expressed my opinions so eloquently – well done Alain. I hope every road user who reads this letter appreciates your considered thoughts and thinks about the environmental and health benefits cycling offers rather than the small delay in their travel time. To all cyclists out there: we are unfortunately as a group under the microscope… so please, please obey the road rules, buy yourself a mirror and drop back into single file with plenty of time for an approaching vehicle to overtake safely – give walkers on shared paths plenty of respect (they have right of way!) because they drive cars too. The Nillumbik Shire and the Mayor don’t seem to understand that cycling is part of the district’s natural assets and the Shire should be supporting and encourage cycling! Cycling tourism would benefit local businesses and enhance the reputation of the Shire. As a Nillumbik resident I expect better than this from our elected representatives. Exceptionally well put. Thank you for writing this Alain. Thank you Alain. Amazing factual piece. Thanks Alain – good to know he doesn’t support banning cyclists up there (stupid idea) but agree it’s a worry he has an issue with 2 abreast. We CAN do it but we DON’T going up there (well i don’t anyway) The signs should go up in a few places too. Thanks Alain for taking the time out to write such a fantastic letter in support of cycling and common sense. With views like these cycling in the Green Wedge can only go from strength to strength.